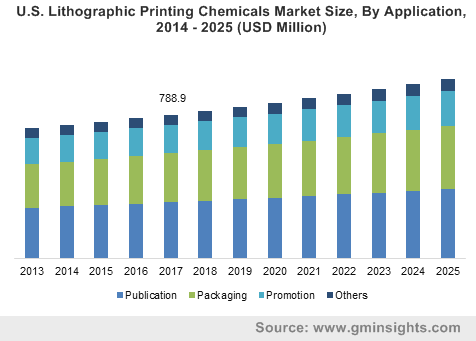 Lithographic Printing Chemicals Market size was estimated over USD 12.5 billion in 2017 and the industry will grow by a CAGR of more than 4% up to 2025. The global lithographic printing chemicals market will be augmented by increasing demand for print media in Asia Pacific countries. Lithographic printing chemicals, also known as offset print chemicals, include inks, cleaners, and other such chemicals needed in the offset print process. Offset technology is extensively used for high volume printing applications such as newspapers, magazines, newsletters, etc. owing to its low-cost nature and ease of printing. The developments in the global print media industry will influence the product market growth during the forecast timeframe. Print media sector in developed regions have been witnessing a downturn in recent years owing to increasing competition from digital media. Countries such as the U.S., Germany, Canada, France, etc. have witnessed a steady decrease in the number of dailies being circulated in their respective countries in the last decade. However, the trend in the countries of Asia Pacific such as China, India, Indonesia, and Malaysia is almost the opposite to that of developed countries. India, the largest market for free and paid-for dailies in the world, has observed more than 70% increase in demand for these dailies from 2012 to 2016. China also witnessed an increase of around 25% in the number paid-for and free dailies during the same time period. Southeast Asia countries such as Indonesia, Thailand, and Malaysia also followed a similar trend over over the last decade. This increase in demand for dailies in Asia Pacific countries will drive the offset print chemicals market growth during the forecast timeframe. Based on product, the global lithographic printing chemicals market has been segmented into inks, fountain solutions, cleaning solutions, and other products such as gumming solution, photographic chemicals, ancillary products, plate coatings, etc. Inks is the largest product segment in the market which will gain by a CAGR of more than 4% during the forecast timeframe. Increasing product demand in print media applications will drive the segment’s industry development. Cleaning solutions for use in offset printing are mixtures of different chemical compounds such as hydrocarbons, solvent naphtha, oils, tensides, corrosion inhibitors, etc. They are used for the regular cleaning and maintenance of the printing machine. Some of the major functions of this product type is to etch ink components and remove the accumulated dirt. This segment accounted for a revenue of over USD 850 million in 2017. Based on application, the offset print chemicals market is segmented into publication, packaging, promotion, and others such as stationery items, books, etc. Publication is the largest application segment which will grow by more than 4.5% during the forecast timeframe. This application includes product usage in the publication of newspapers, magazines, newsletters, etc. High growth of print media industry in the countries of Asia Pacific will drive the segment’s market. 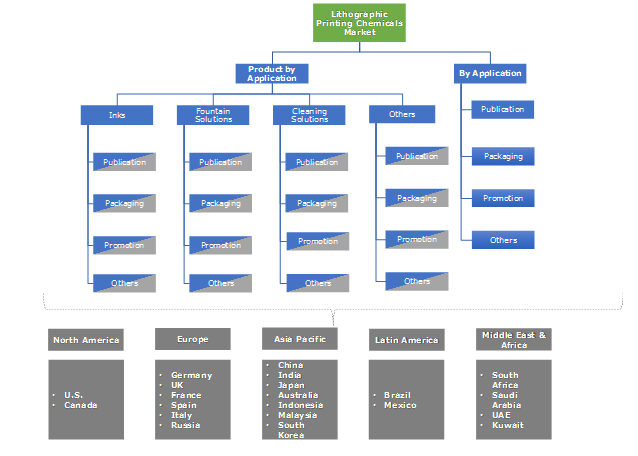 Promotion is also a key application segment of the lithographic printing chemicals market. This includes product usage in production of promotional materials such as leaflets, posters, advertisements, etc. Although, the use of flexographic technology for this application is rising in recent years, offset technology is still used widely for promotional applications. Developments in the print advertisement sector will be the major factor boosting product demand for promotion application. Asia Pacific is the largest lithographic printing chemicals market in the globe, driven by increasing demand in China, India, and Indonesia. The region’s offset print industry revenue was recorded at around USD 9.8 billion in 2017. The regional packaging industry will also be a key factor driving the product market growth. Increasing production of packaging materials and labels using offset technology in Asia Pacific countries will augment the industry growth in the forecast timeframe. North America offset print chemicals market will grow slowly by a CAGR of approximately 2.5% during the forecast timeframe. Increasing usage of digital printing in the region coupled with decreasing demand for newspapers and magazines have been the major reason behind the region’s low growth rate. However, the possibility of low-cost and high-volume printing with offset technology will still boost product demand in the region in the forecast period. Global lithographic printing chemicals market is characterized by the presence of many local and multinational companies. Some of the major players in the market includes T&K TOKA Corporation, Toyo Ink Company, Flint Group, DIC Corporation, TCI Graphics, Siegwerk Druckfarben AG & Co., Sakata Inx Corporation, Huber Group, Tokyo Printing Ink Company, SICPA Holding SA, Daihan Ink Company., FUJIFILM Holdings America Corporation, Dainichiseika Color & Chemicals Mfg. Co., Ltd., Wikoff Color Corporation, Yip's Chemical Holdings Limited, and many more. Offset print technology is one of the oldest and most widely used printing technique in the world. It enables printing large volumes in a short amount of time and in much lower costs when compared with other technologies. Newspapers and magazines are the most common applications for lithographic print chemicals. Decreasing print media demand across the globe, especially in the Western countries will limit product usage during the forecast timeframe. However, product usage to print packaging materials and labels will drive the industry growth during the forecast timeframe.